During the first weeks of the new 8th-grade PhotoScience class, students investigated the basic principles behind light and vision through "laser labs." Photographing abstract patterns in the dark studio provided an artistic challenge as well. The class also researched photo pioneer Anna Atkins and her technique of making blue print books using basic chemicals, sunlight and water. 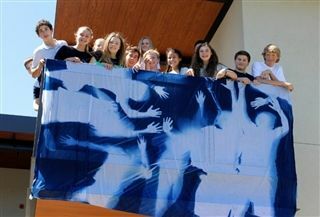 Students replicated this cyanotype process by creating a large group mural on a sheet of fabric. The STEAM integration will continue through the trimester as students combine art, physics and chemistry in experiments, photo contests and a digital camera-building project.